For an Estonian decoration, see Order of the Cross of Terra Mariana. 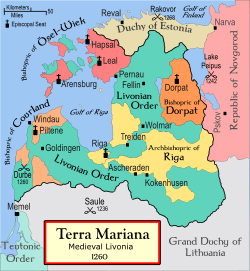 Terra Mariana (Medieval Latin for "Land of Mary") was the official name for Medieval Livonia or Old Livonia[a] (German: Alt-Livland, Estonian: Vana-Liivimaa, Latvian: Livonija), which was formed in the aftermath of the Livonian Crusade in the territories comprising present day Estonia and Latvia. It was established on 2 February 1207, as a principality of the Holy Roman Empire but lost this status in 1215 when proclaimed by Pope Innocent III as directly subject to the Holy See. After the 1236 Battle of Saule the surviving members of the Brothers merged in 1237 with the Teutonic Order of Prussia and became known as the Livonian Order. In 1346 the Order bought Danish Estonia. Throughout the existence of medieval Livonia there was a constant struggle over supremacy, between the lands ruled by the Church, the Order, the secular German nobility and the citizens of the Hanseatic towns of Riga and Reval. Following its defeat in the Battle of Grunwald in 1410 the Teutonic Order and the Ordensstaat fell into decline but the Livonian Order managed to maintain its independent existence. In 1561, during the Livonian war, Terra Mariana ceased to exist. Its northern parts were ceded to the Swedish Empire and formed into the Duchy of Estonia, its southern territories became part of the Grand Duchy of Lithuania — and thus eventually of the Polish–Lithuanian Commonwealth — as the Duchy of Livonia and the Duchy of Courland and Semigallia. The island of Saaremaa became part of Denmark. Since the beginning of the 20th century Terra Mariana (Estonian: Maarjamaa) has been used as a poetic name or sobriquet for Estonia. In 1995 the Order of the Cross of Terra Mariana, a state decoration, was instituted to honor the independence of Estonia. The lands on the eastern shores of the Baltic Sea were the last part of Europe to be Christianized by the Roman Catholic Church. In 1193 Pope Celestine III called for a crusade against the pagans in Northern Europe. This crusade is often compared to the crusade of the Franks and Charlemagne. However, this crusade was not officially announced until 1197 or 1198, but the first account of this crusade is in a letter by Pope Innocent III. At the beginning of the 13th century, German crusaders from Gotland and the northern Holy Roman Empire conquered the Livonian and Latvian lands along the Daugava and Gauja rivers. The stronghold of Riga (capital of modern Latvia) was established in 1201, and in 1202 the Livonian Brothers of the Sword was formed as a branch of the Knights Templar. In 1218 Pope Honorius III gave Valdemar II of Denmark free rein to annex as much land as he could conquer in Estonia. Additionally Albert of Riga, leader of the crusaders fighting the Estonians from the south, paid a visit to the German King Philip of Swabia and asked permission to attack the Estonians from the North. The last to be subjugated and Christianised were Oeselians, Curonians and Semigallians. This crusade differed from many other crusades because, in this case, the Pope allowed people intending to go on a crusade to the Holy Land to go instead to crusade in Livonia. Members of this crusade were made to wear the insignia of the cross as well, which showed that they were legally bound to the crusade. After the success of the crusade, the German- and Danish-occupied territory was divided into feudal principalities by William of Modena. This division of medieval Livonia was created by Papal Legate William of Modena in 1228 as a compromise between the church and the Livonian Brothers of the Sword, both factions led by Germans, after the German knights had conquered and subdued the territories of several indigenous tribes: Finnic-speaking Estonians and Livs, and Baltic-speaking Latgalians, Selonians, Semigallians and Curonians. Medieval Livonia was intermittently ruled first by the Brothers of the Sword, since 1237 by the semi-autonomous branch of Teutonic knights called Livonian Order and the Roman Catholic Church. By the mid 14th century, after buying the Duchy of Estonia from Christopher II, the Livonian Order controlled about 67,000 square kilometers of the Old Livonia and the Church about 41000 km2. The lands of the Order were divided into about 40 districts governed by a Vogt. The largest ecclesiastical state was the Archbishopric of Riga (18,000 km2) followed by the Bishopric of Courland (4500 km2), Bishopric of Dorpat, and Bishopric of Ösel-Wiek. The nominal head of Terra Mariana as well as the city of Riga was the Archbishop of Riga as the apex of the ecclesiastical hierarchy. In 1240 Valdemar II created the Bishopric of Reval in the Duchy of Estonia by reserving (contrary to canon law) the right to appoint the bishops of Reval to himself and his successor kings of Denmark. The decision to simply nominate to the See of Reval was unique in the whole Catholic Church at the time and was disputed by bishops and the Pope. During this era, the election of bishops was never established in Reval, and the royal rights to the bishopric and to nominate the bishops were even included in the treaty when the territories were sold to the Teutonic Order in 1346. Throughout the existence of medieval Livonia there was a constant struggle for superiority in the rule over the lands by the Church, the order, the secular nobles of German descent who ruled the fiefs and the citizens of the Hanseatic town of Riga. Two major civil wars were fought in 1296–1330, 1313–1330, and in 1343–1345 the Estonian revolt resulted in the annexation of the Danish Duchy of Estonia within the Teutonic Ordensstaat. Technically, the Archbishop of Riga was the feudal and ecclesiastical superior, first over the Teutonic Knights, later over the Livonian Order. But the Archbishop did not become the dominant political power; already the Knights had thrown off the episcopal dominion, later the Livonian Order tried to unify the country under their leadership. The bishops of Dorpat, Courland and Ösel-Wiek were lesser powers. The most important ally of the Livonian Order was the German nobility in the Danish Duchy of Estonia. In the beginning of the 14th century Denmark was no longer a powerful state and the local German nobility had effectively become the rulers of the territory. After the Estonians of Harju started a rebellion in 1343 (St. George's Night Uprising) the Teutonic order occupied the territories. The overthrow of Danish rule came two days after the Order had defeated the Estonian revolt. The Danish viceroy was imprisoned in cooperation with the pro-German vassals. The castles in Reval and Wesenberg were handed over to the Order by the German nobility party on 16 May 1343 and the castle at Narva in 1345. In 1346, the Estonian territories (Harria and Vironia) were sold by the king of Denmark for 19,000 Köln marks to the Teutonic Order. The shift of sovereignty from Denmark to the Teutonic Order took place on 1 November 1346. The Teutonic Order fell into decline after Poland and Lithuania defeated it in the Battle of Grunwald in 1410. The Livonian Order managed to maintain an independent existence, as it did not participate in the battle and suffered no casualties, having obtained a truce with Grand Duke Vytautas. In 1418 Pope Martin V nominated Johannes Ambundii to the position of Archbishop of Riga. He became known as the organizer of the Livonian confederation. Conflict commonly occurred between the Order, the bishops, and the powerful Hanseatic cities throughout the existence of medieval Livonia. To solve internal disputes, the Livonian Diet or Landtag gathered in 1419 at the initiative of Archbishop Ambundii. The city of Walk was chosen as the site of the Diet. The Diet comprised members of the Livonian Order, Livonian Bishops, vassals and city representatives. On 1 September 1435 the Livonian Order's defeat in the Battle of Swienta (Pabaiskas), claiming the lives of the Master and several high-ranking knights, brought the order closer to its Livonian neighbours. The Livonian confederation agreement (eiine fruntliche eyntracht) was signed in Walk on 4 December 1435, by the archbishop of Riga, the bishops of Courland, Dorpat, Ösel-Wiek and Reval; the representatives of the Livonan Order and vassals, and the deputies of Riga, Reval and Dorpat city municipal councils. The states of the Livonian Confederation ceased to exist during the Livonian War of 1558–1582. In 1559 the Bishop of Ösel-Wiek and Courland Johannes V von Münchhausen sold his lands to King Frederick II of Denmark for 30,000 thalers. The Danish king gave the territory to his younger brother Duke Magnus of Holstein who in 1560 landed with an army on Ösel. In 1561 a Swedish army landed in Reval and gained control over the northern part of Old Livonia. The Livonian Order was dissolved by the Treaty of Vilnius in 1561. The following year, the Livonian Diet decided to ask protection from Sigismund II Augustus (King of Poland and Grand Duke of Lithuania). With the end of government by the last Archbishop of Riga, William of Brandenburg, Riga became a free imperial city and the rest of the territory was split between two Polish-Lithuanian vassal states: the Duchy of Courland and Semigallia (Polish vassal) and the Duchy of Livonia (Lithuanian vassal). ^ referred to by historians as Medieval Livonia or Old Livonia to distinguish it from the rump-Livonia (Duchy of Livonia) and the Livonian Governorate that was formed from part of its territories after its breakup. ^ William of Modena divided Livonia among the three bishoprics-Riga, Dorpat [Tartu], and Ösel-Wiek [Saaremaa-Läänemaa]-and the Order of Swordbrothers. ^ a b "Terra Mariana". The Encyclopedia Americana. Americana Corp. 1967. ^ Raun, Toivo U. (2002-02-01). "Medieval Livonia, 1200–1561". Estonia and the Estonians: Second Edition, Updated. Hoover Press. p. 15. ISBN 9780817928537. ^ Miljan, Toivo (2015-05-21). Historical Dictionary of Estonia. Rowman & Littlefield. pp. 29–30. ISBN 9780810875135. ^ Bilmanis, Alfreds (1944). Latvian-Russian Relations: Documents. The Latvian legation. ^ Herbermann, Charles George (1907). The Catholic Encyclopedia. Robert Appleton Company. ^ Bilmanis, Alfreds (1945). The Church in Latvia. Drauga vēsts. ^ a b Christiansen, Eric (1997). The Northern Crusades. Penguin. p. 111. ISBN 0-14-026653-4. ^ Knut, Helle (2003). The Cambridge History of Scandinavia: Prehistory to 1520. Cambridge University Press. p. 269. ISBN 0-521-47299-7. ^ a b c William Urban. "An Historical Overview of the Crusade to Livonia". ORB. Retrieved 29 May 2011. ^ O'Connor, Kevin (2005). "Religion". Culture and customs of the Baltic states. Greenwood Publishing Group. p. 35. ISBN 0-313-33125-1. ^ The Latvians: A Short History. ^ a b Urban, William (1981). Livonian Crusade. University Press of America. ISBN 0-8191-1683-1. ^ Christiansen (1997), p. 227. ^ Wendehors, Alfred (1989). Das Stift Neumünster in Würzburg. Walter de Gruyter. p. 503. ISBN 3-11-012057-7. ^ Bilmanis, Alfred (2007). Latvia as an Independent State. READ BOOKS. p. 67. ISBN 1-4067-2870-5. ^ The History of the Baltic States. ^ a b Plakans, Andrejs (1995). The Latvians: a short history. Hoover Press. p. 23. ISBN 0-8179-9302-9. ^ Miljan, Toivo (2004). Historical dictionary of Estonia. Scarecrow Press. p. 169. ISBN 0-8108-4904-6. ^ Raudkivi, Priit (2007). Vana-Liivimaa maapäev. Argo. pp. 118–119. ISBN 9949-415-84-5. ^ Vane, Charles William (1838). Recollections of a tour in the north of Europe in 1836–1837. p. 178. ^ Brand, Hanno (2005). Trade, diplomacy and cultural exchange: continuity and change in the North Sea area and the Baltic, c. 1350–1750. Uitgeverij Verloren. p. 17. ISBN 90-6550-881-3. ^ Plakans, Andrejs (2011). A Concise History of the Baltic States. Cambridge University Press. p. 95. ISBN 0-521-54155-7.